A woman has died after the miniature railway train she was driving collided with a car at a level crossing. The incident, near Dungeness in Kent, involved a train from the Romney, Hythe and Dymchurch Railway, which derailed after the crash on Sunday evening. A number of passengers were on board the train but no-one else was injured, Kent Police said. Officers were questioning the driver of the silver coloured Vauxhall who was still being held on Monday morning. A police spokesman said the incident occurred at approximately 1820 BST, near the level crossing at Coast Drive, near Dungeness. The crossing does not have barriers. "The train was heading for the level crossing junction, when the driver of a silver Vauxhall was in collision with the train," the spokesman said. "The train was derailed and the driver, who was a woman, died following the collision." People living nearby helped passengers off the derailed train but were unable to rescue the driver. Local resident Willie Richardson said: "We heard the bang and my daughter-in-law was helping get people out of the carriage while I went to the engine to see if we could be of any help there. "But there was so much steam that you couldn't get near it, it was so hot." The Romney, Hythe and Dymchurch Railway runs for 13.5 miles between Hythe and Dungeness. It is the second fatal incident on the line in the past two years. 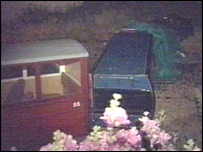 In August 2003 a male train driver was killed at a level crossing after colliding with a car. The driver of the car in the 2003 collision admitted careless driving. She was disqualified for 12 months and received a £500 fine. 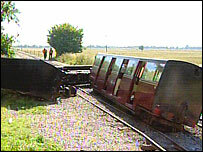 In November 2004 a train on the railway was derailed after a plank of wood was placed on the tracks. A railway spokesman declined to comment on Sunday's accident.